In a recent interview, David Reeves mentioned that the 60GB PS3 model will be discontinued in North America, once stock sells out. This move has now been denied by Dave Karraker, SCEA President. Karraker stated that the quotes obtained in the interview in regards to a 60 gigabyte Playstation 3 phase out was “inaccurate”. The claim was backed up by Sony Canada spokesman Kyle Moffatt. Kaz Hirai however, in a interview, stated that the 60GB PS3 model is no longer in production and will soon be phased out. Peter Dille, Senior Vice President of Marketing for SCEA, told Gamasutra today that movie download service for PSP and PS3 will be coming very soon, and that the company is actively working on the service. Sony is working hard on the service to ensure that it makes a good impression on consumers when it is launched. Sony has confirmed that they will not be cutting the price of the PlayStation 3 in Europe or releasing a 80GB model – instead it will be offering a Starter Pack containing the console, two games and an extra controller for GBP 425 / EUR 599. The announcement will also affect Australia. SCEE has chosen to bundle first-party titles and a second SIXAXIS controller with a combined RRP of GBP 115, rather than lower the price. The bundle pack is due on sale in the UK on July 18 and in Europe August 1, the Starter Pack will offer two Sixaxis controllers and a choice of two first-party titles from a list of Resistance: Fall of Man, Motorstorm, Genji: Days of the Blade, Formula One Championship Edition and Ridge Racer 7.
said David Reeves, president of SCEE. 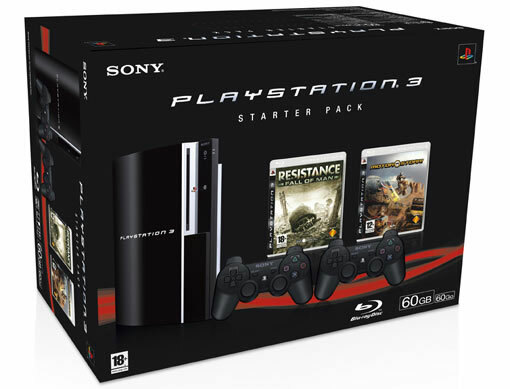 With the introduction of the Starer Pack, the PS3 price in the UK will return to £425. Most UK retailers dropped the price of the PS3 to £399 a while back to increase sales, but since the new unit will cost more, it is likely that retailers will increase the price to the original RRP. SCEE president David Reeves has told GamesIndustry.biz that the 60GB PlayStation 3 will no longer be available in the US after stock sells out – which he predicts will occur by the end of the month. Reeves was speaking at an E3 event to announce the introduction of a new PS3 bundle in Europe. When asked about possible criticisms over whether SCEE should have given consumers the option to pay a lower price, as SCEA has done, he replied, “Well, they’re not really are they, because what the US are offering from the 1st of August is a USD 599 version with one game. When asked to clarify if this will mean the end of the 60GB model, Reeves answered, “In America, yes.” This blow comes only a few days after the 60GB PS3 was lowered in price, effectively making the price cut void. After stock runs out, the only available model will be the 80GB version retailing at $599, since the 20GB version has already been discontinued. Sony is confident about meeting its goal of selling 11 million PlayStation 3 units this fiscal year as the recent price cut and a slate of new games draw in consumers. “We’re very well-poised to get to that number on a worldwide basis,” Kaz Hirai, president of Sony Computer Entertainment, told Reuters in an interview. Sony’s fiscal year runs through the end of March. A high price and relative lack of blockbuster games has dampened sales of the PlayStation 3, and Sony has tried hard to rectify both issues this week at E3, the $30 billion video game industry’s most important trade show. On Monday, Sony cut the PS3’s price in the United States by $100, or 17 percent, to $499, narrowing the gap with Microsoft Corp.’s Xbox 360, which comes in three versions priced between $300 and $480. Since it went on sale last November, the PS3 has sold 1.4 million units in the United States through May, compared to 2.8 million units for Nintendo Wii console, according to market research firm NPD. The Xbox 360, which debuted in November 2005, has sold 5.6 million units. Santa Monica, 12th July 2007 – Sony Computer Entertainment Europe (SCEE) today announced the availability of a high value Starter Pack for PLAYSTATION 3, comprising a PS3, two first party games and two SIXAXIS wireless controllers, at €599. The choice of first party games available in the Starter Pack will vary to suit the interests of entertainment enthusiasts in each country, but will include million sellers such as Resistance Fall of Man and MotorStorm; titles specifically chosen to demonstrate the stunning graphics and enhanced gameplay of High Definition games on Blu-ray disc. “The exceptional value of the new Starter Pack will bring the excitement of PlayStation gaming to a much wider audience. Add to this a stellar lineup of software titles for the second half of the year and we are confident that this amazing value Starter Pack will encourage many more keen gamers to join the PLAYSTATION 3 community”. Sony has stated many times that the PS3 may not receive a price cut in Europe, but will instead get better value packs. The official announcement isn’t until later today at E3, but we have heard that the European market will be getting a new bundle pack .The ‘PS3 Starter Pack’, retailing for EUR 600 (GBP 410), will come complete with a 60GB PS3, Resistance: Fall of Man and Motorstorm, plus as two SIXAXIS controllers. The official announcement will be on July 13th 2007, at 5:00 AM BST. We will bring you an update on this story tomorrow. During Sony’s Press Conference yesterday, Phil Harrison demonstrated a feature that is new to Home. PS3 games will be able to be launched directly from inside Home, from both a Blu-Ray disc and from the hard drive. Harrison stepped into a room with eleven other people in the virtual world. He then proceeded to invite them all into a game of Motorstorm, which booted straight from Home’s PSP menu system into the multiplayer lobby, with all the people he invited ready to start. After a few minutes of playing, Harrison decided that he’d played enough Motorstorm for now and quit the game straight back into Home. This is a feature we’re very excited about and we cannot wait to take full advantage of it once the open beta hits next month. Harrison also mentioned that the Home client is now running on mobile phones, however, it will not support 3D avatars. CULVER CITY, Calif., July 11, 2007 – Today, at their annual press conference during the E3 Media and Business Summit, Sony Computer Entertainment America Inc. (SCEA) announced new games and services for its PLAYSTATION Network, an emergent entertainment network aimed at delivering innovative content and community to a worldwide audience. SCEA unveiled new features for the highly-anticipated PlayStation Home, a 3D community-based service set to revolutionize the broadband entertainment world, and announced new content for its PLAYSTATION Network. In addition, SCEA introduced several new downloadable games designed specifically for PLAYSTATION Network, including a crafty puzzle game called echochrome that takes full advantage of the PLAYSTATION 3 system’s (PS3) SIXAXIS wireless controller; an achingly funny action game named PAIN; and the next chapter in the popular WipeOut racing series, WipeOut HD. Also demonstrated was a pair of games available through download from PLAYSTATION Store and on Blu-ray Disc (BD) : SOCOM US Navy SEALs: Confrontation, the next title in line of one of the most popular franchises in PlayStation history; and Warhawk, a ground-breaking online multi-player air and land combat game. These much-anticipated titles are central to the 2007 PLAYSTATION Network roadmap and are part of the more than 40 innovative games and game packs in development from SCEA for download via PLAYSTATION Network this fiscal year in North America . Launch Games Within PlayStation Home: Users will have the ability to launch Blu-ray Disc (BD) or PLAYSTATION Network games from inside PlayStation Home. Since PlayStation Home is designed to be a virtual meeting place for a worldwide community, users who want to play a game together can meet in one location to set options and start the multi-player online game. New Home Square: The newly designed Home Square replaces the PlayStation Home lobby concept first introduced at the Game Developers Conference in March. The new open-air space provides internal developers with more flexibility to build upon the community experience. New Personal Spaces: Four new apartments including a Beach House, Norwegian Cabin, Manhattan Penthouse and a traditional Japanese House, were introduced today to allow for additional user choice and personalization. CULVER CITY, Calif., July 11, 2007 – Sony Computer Entertainment America Inc. (SCEA) today previewed a robust third-party software line-up and announced new exclusive game publisher alliances for PLAYSTATION 3 (PS3™) at their annual press conference during the E3 Media and Business Summit. In addition to the more than 30 third-party titles available since launch, this fiscal year over 100 new third-party titles will be released for PS3, bringing the total number of first- and third-party games in North America to more than 160. This extensive library encompasses industry leading franchises as well as new intellectual properties from Activision, Capcom, Electronic Arts, NAMCO BANDAI, Ubisoft and Eidos. During the press conference, exclusive third-party PS3 games and key partnerships were announced from, NCsoft Corporation, Ubisoft, Midway and Konami. The strategic alliance with NCsoft, the world’s leading developer and publisher of online games, will provide a wealth of connected gaming expertise and create several online games exclusively for PlayStation platforms, including PS3 and PSP (PlayStation Portable), accessible through the PLAYSTATION Network. NCsoft is the creator of Lineage, the world’s largest online game franchise with a customer reach of more than 60 million. In addition, PlayStation fans will have further reason to get excited about growing their game libraries as Sony Computer Entertainment (SCE) and industry veterans Epic Games announced a multi-stage agreement. Revolutionizing the industry with the advent of the Unreal Engine when first launching the Unreal franchise several years ago, Epic Games has joined with SCE to fully optimize the Unreal Engine for PS3 development to assist developers using this engine to accelerate game creation and maximize performance. Already underway, this optimization currently affects seven developers using the Unreal Engine to create 20 games already in the works and with many more to come. As a result of the agreement, Midway and Epic Games will make the platform debut of Unreal Tournament 3, one of the world’s premiere first-person shooters, exclusively on PS3 this fall, unleashing the full power of Unreal Engine 3 with graphics, gameplay and challenges brought to a whole new level. Featuring powerful futuristic weapons and vehicles unlike anything seen before, players will engage in intense and hyper-realistic battles with other players online, or against the Unreal artificial intelligence that has become the defacto industry standard. Also, releasing this fall, legendary PlayStation development team Free Radical Design and leading publisher Ubisoft have teamed up to deliver the mind-altering, technologically superior game HAZE exclusively for PS3 this holiday season. This highly anticipated first-person shooter marks the next-generation debut for Free Radical, and will introduce unique gameplay driven by ‘Nectar’. Providing players with the opportunity to fight on both sides of the same war, HAZE also features genre-defining multiplayer action for the PLAYSTATION Network. Set for a simultaneous worldwide launch in early 2008 exclusively on PS3, a new trailer for Metal Gear Solid 4: Guns of the Patriots also was unveiled during the press conference. In a six minute presentation of all-new footage, the latest Metal Gear Solid 4 trailer features stunning real-time graphics, new revelations in the ongoing Metal Gear saga, and a new location that will be one of many backdrops of Solid Snake’s final, globetrotting mission. In its first-ever presentation in English, the new trailer also offers a taste of Kojima Production’s ambitious, stylized localization of the game’s original script, penned by Hideo Kojima himself, and highlighted by the return of the industry’s most memorable voice talent, featuring David Hayter as Old Snake, Pat Zimmerman as Liquid Ocelot, and Phil LaMarr, who will reprise his role as iconic Metal Gear Solid 2 character, Vamp. In addition to these key exclusives from NCSoft, Ubisoft, Midway, Konami, Epic Games and many other publishers, gamers can look forward to 15 more PS3 only games from SCE this fiscal year that truly demonstrate the advanced technological capabilities of the system.